In grazing incidence optics the effective area is increased by nesting a number of mirrors and thus filling the front aperture as much as possible. The nesting efficiency is determined by the mirror shell thickness and, in case of very low grazing angles, by the minimum radial mirror separation which is required for integration and alignment. The thinner the mirror shells are and the narrower the shells are spaced, the larger is the collecting area. 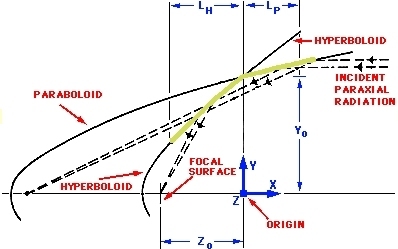 The thickness of the smallest mirror (diameter = 306 mm) is 0.47 mm, and it increases linearly with shell diameter in order to guarantee sufficient stiffness. The thickness of the 700 mm diameter mirror is 1.07 mm. The minimum radial separation between adjacent shells is 1 mm. Adding more shells is rather inefficient in building up more collecting area because of the mass penalty involved and the low gain in effective area.